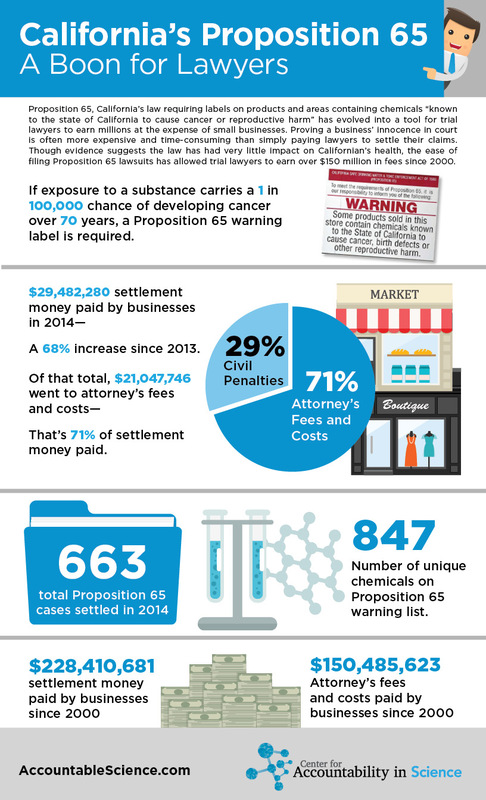 We’ve talked extensively on our blog about the problems with California’s chemical warning law known as Proposition 65. It requires warning labels on everything from coffee to sunglasses without offering consumers any context about the actual risk of chemical exposure. Instead of helping Californians make healthier choices, the law has been used as a tool for bounty hunters to extort six-figure settlements from small businesses. 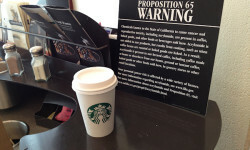 Under a new change issued by California this week, Proposition 65 lawsuits could become even easier to file. 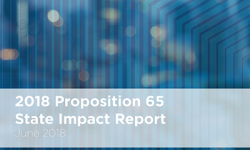 The California agency in charge of Proposition 65 regulations, OEHHA, issued a new regulation on Monday creating a dedicated Proposition 65 website for consumers. The website will feature information explaining which chemicals are included in consumer products and methods of common exposure. Information will be pulled from OEHHA, interested third parties (like environmental activist groups), and manufacturers. The regulation itself doesn’t give a great sense of what information will be included on this website or what the final product will look like. But there are already strong indications it’s not going to do much to help consumers. Here are just a few of the problems with California’s new proposal. The website still won’t give consumers adequate information about their risk of health problems. 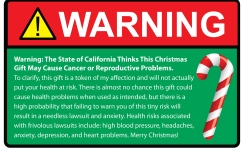 California requires a label on any product known to the state of California to cause one excess case of cancer in 100,000 people over a 70 year lifetime. That’s an extremely, extremely small threshold. 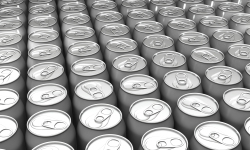 While OEHHA’s regulation spells out how it will collect information on levels of specific chemicals in consumer products, it won’t put that information in context for consumers about what that means for their health. To the average consumer, information about parts per million or billion of an ingredient don’t mean anything! Some products that require a Proposition 65 warning, like aspirin, birth control pills, and alcohol, actually have health benefits that can outweigh health risks for consumers who use the product responsibly, as intended. Yet OEHHA only focuses on the health risks of a particular product and manufacturers aren’t allowed to put those warnings in context on their products. The rules allow third parties to submit content for the website about manufacturers products, but doesn’t allow manufacturers to see or correct content before its published on the website. OEHHA says its scientific and legal experts will review all material before it’s published on the website, but the state doesn’t have a great track record with publishing correct information about consumer products. In 2014, as part of the state’s Green Chemistry program, the state put spray foam insulation (a product that helps make homes more energy efficient) on the list to “phase out” after the state mistakenly assumed the insulation contained two chemicals that aren’t in it. Not allowing manufacturers to give their input before erroneous information is given to the public doesn’t help anyone except trial lawyers hoping to use the website to find new businesses to sue. The website will become a valuable tool for bounty hunters and lawyers. Considering most consumers ignore Proposition 65 warnings anyway, it’s unlikely many average consumers will rely on the website for information. The website will, however, be a valuable tool for bounty hunters looking for new businesses and products to target with lawsuits. Consider: OEHHA says the website will talk about products in “generalities” about product categories, not specific brands. Not every brand of screwdriver, for instance, will use the same chemicals in its handles. But if OEHHA says screwdrivers contain a Prop 65-listed phthalate, bounty hunters could sue manufacturers and retailers that don’t have Prop 65 warning labels on their screwdrivers—even if they’re free of that chemical. Defending against one of these lawsuits is expensive, time consuming, and difficult to win—especially for small businesses. When asked by businesses, OEHHA decline to add language to the website rules prohibiting lawsuits or legal claims based on information posted on the website. More information isn’t always better. Consumers should absolutely be warned if a product poses genuine health risks, but that simply isn’t the case for most products carrying a Prop 65 warning label. Many of the chemicals listed by California have never been shown to cause health problems in humans—just in animals given extremely high doses. Your risk of health problems from wearing sunglasses or flip flops is so low, it’s virtually nonexistent. If you’ve been affected by Proposition 65, click here to tell us your story. Check out our video below describing the devastating effect this law has on small business owners. 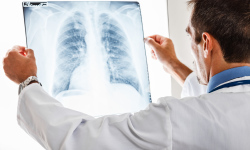 Are Most Cancer Cases Really Caused by ‘Bad Luck’?